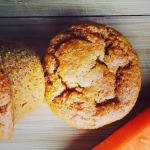 Gluten Free, Vegan, Ginger Carrot Muffins – Dr. Melissa Lee ND., RAc. This recipe was adapted from Bunner's Bakeshop Cookbook. The key to simplicity in any gluten free, vegan recipe is having a Gluten free flour that works for you. Preheat your oven to 400 degrees Fahrenheit and line a 12 cup muffin tin with muffin liners. In a bowl combine your milk and vinegar and set aside for 10-15 minutes. In another large bowl mix all your dry ingredients: flour, baking powder, baking soda, ginger, cinnamon, nutmeg, xanthum gum, salt. In a separate bowl mix your wet ingredients: honey, applesauce, grapeseed oil, molasses and milk/vinegar mixture. Fold in the carrots and let the batter sit for 15 minutes. Pour the batter into the muffin tin and bake for 25 minutes. Cool for 15 minutes before taking the muffins out of the tins.